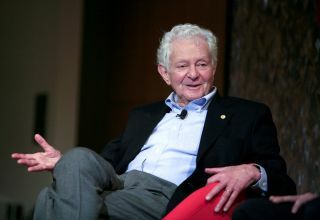 Nobel Prize-winning physicist Leon Lederman speaks at the panel discussion “Pioneers in Science” at the World Science Festival on May 29, 2008, in New York City. Leon was a legend in the world of particle physics. Known perhaps most for coining the phrase "The God Particle," in his book of the same name, Leon had a distinguished scientific career. From humble beginnings as the son of immigrants, whose father operated a hand laundry, Lederman rose to the very pinnacle of scientific achievement. He also wrote the book "The God Particle" in 1993, which told the story of the Higgs boson particle and many of Lederman's adventures during his physics career. Much to the chagrin of physicists everywhere, the name stuck. Lederman's achievements are many, and I recommend that you read his formal obituary to learn much more about the life and career of this very accomplished scientist. But I want to talk more about Leon the man. I knew Lederman well, albeit the difference in our ages meant that we lived quite different lives. When I first came to Fermilab in 1987, I was a graduate student, a callow youth still finding my way in the world of science. In contrast, Leon was the director of the lab and obviously not one to be bothered with the likes of youngsters like myself. But that's not the kind of guy he was. Case in point: In the Fermilab cafeteria, in addition to the typical seating areas, there are a couple of large round tables around which it is customary for senior scientists to gather and discuss the topics of the day; there is no rule though that others can't join in. Lederman, being the director, would often eat there. Quite a few times, I'd sit at the table and talk with the group, occasionally conversing with Lederman. He never made anyone feel uncomfortable and he was happy to talk shop, tell a joke, or ask about how one's experiment was going. Sometimes, he'd help you brainstorm solutions to problems you were having with your measurement. He was a jovial and fun guy. When his Nobel Prize was announced in 1988, my first thought was, "What for?" That wasn't because I couldn't think of an accomplishment of his worth the prize, but rather, I couldn't decide which one. Leon discovered "parity violation" in the decay of subatomic particles called pions and muons, which, in a roundabout way, ties to differences in matter and antimatter. (All particles have strange siblings called antiparticles that have the same mass but the opposite spin and charge.) He discovered a long-lived neutral subatomic particle called a kaon, which was the first real laboratory for studying how matter could morph into antimatter and back again. He discovered that there was not a single type of neutrino, but rather that there were two (and eventually three). He also led a team that found the bottom quark, which proved that there were not two families of subatomic particles called quarks and leptons, but rather there were three. On the day that Leon's Nobel was announced, we had a huge party at Fermilab. I had only been at the laboratory for a year, but the staff fashioned him a pretend medal and crown made of tinfoil and he wore them good-naturedly as he wandered around the Fermilab atrium, accepting congratulations from well-wishers. I got to shake his hand…the first time I had ever met a Nobel laureate. During his tenure as Fermilab director, Lederman would give public lectures. In fact, his lectures were legendary, full of interesting stories, corny jokes and a repartee that made a non-expert listener appreciate the fascinating world of frontier physics. Every time I heard of a talk he was giving, I'd be sure to attend. It's not that I went to learn physics…after all, those talks weren't aimed at scientists, but rather members of the public. But I learned a lot about public speaking by watching him. If you've ever seen me give a talk and found my humor to be a trifle on the side of making you facepalm, you can thank Leon for setting me on that path. And Lederman wrote books for the public, the most famous of which was "The God Particle." An autographed copy of it has an honored place in my library. The book is a fun read — his personality really comes through — I recommend you read it if you'd like to get a sense of the voice of the man. And when I read it, I began thinking, "Hey, I can do this too." It took about a decade, but I eventually joined him as a writer of scientific books for the public. And I was very grateful when Leon agreed to write a foreword for my second book. He was a gracious man, willing to help others.